Explore anything and everything New Orleans in a guided walking tour. 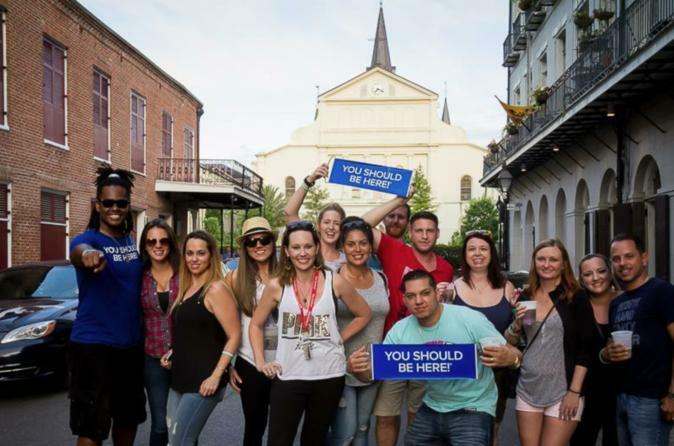 This 'New Orleans Five-in-One Extravaganza Tour' is the one and only tour that provides visitors with five different tours combined. It's a great way to experience all the top New Orleans tours in a 2-hour (approx) period. Guests will visit all the most popular locations during this tour, inside the French Quarter. Guests will also visit locations that are considered the locals sweet spots! This tour includes history, ghosts, vampires, voodoo, celebrity homes and filming locations. A real EMF Meter - Ghost/Paranormal Detector will be used during this tour. Guests will be allowed to stop and grab to go drinks during the tour. Join this tour where learning is intoxicating! During this eerie and fun-filled tour around New Orleans, explore the legends and lore that have made the Big Easy famous. Meander through the mysterious and mystical realms of voodoo, vampires, ghosts, and pirates. New Orleans is known as 'America’s Most Haunted City' for good reason. On this tour, see exactly why. Guests will visit the sites of actual, documented hauntings and share the most ghastly and horrific history that New Orleans has to offer. Unlock the mystery and get ready for the true paranormal experience this adventure can offer — jaw-dropping, heart-pounding, immensely thrilling, and spine-chilling fun. Visit multiple locations where both ghost and vampire sightings happen regularly. Along the way, learn about the practice of voodoo and how it played and continues to play a vital role in New Orleans today. Visit the location that was given to the notorious voodoo queen Marie Laveau as payment for voodoo practices to get a man cleared of murder charges. Visit the location where regular voodoo ceremonies were held. Visit the home of the evil Delphine LaLaurie. Viewers of 'American Horror Story: Coven' will recognize this as the home where she tortured and murdered slaves and then bathed in their blood. It is said to be the most haunted house in New Orleans. Learn about the history of Jackson Square, and the heart of the French Quarter. Visit the exact location where the Louisiana Purchase was signed, as well as multiple Louisiana State museums and the oldest operating church in the US. Guests will hear stories about how New Orleans has been almost completely wiped out many times by natural disasters, fires, and the yellow fever epidemic, yet it has always rebounded, returning to life a little stronger each time. Guests will visit a cemetery that is located inside the French Quarter. While there the tour guide will talk about the above-ground tombs and the Oven Wall Vaults seen in some of the New Orleans cemeteries. The tour guide will explain Louisiana Burial Practices, too. Discover the Treaty of Fontainebleau — shocking when discovering why the spirit of a Capuchin monk still sits outside St. Anthony's Garden, singing for hours. Learn about the founders of New Orleans and how the 'Casket Girls' played a leading role as some of the first settlers in the city. Visit numerous locations where unforgettable movies have been filmed, and finally, see where Hollywood stars have decided to call the French Quarter home. To add to the fun and entertainment of this tour guests will be allowed to stop in bars along the tour route and purchase a to go drink before the group heads out to the next location. Please keep in mind that some bars allow children inside however some do not.